Kat has already introduced us to the process of changing colour with her tutorial early in Knit Camp. I hope that you found this straightforward when knitting Joanne’s Knit Flat Hat. With this technique you can easily create horizontal stripes in your work, and so you already have the basics of colourwork under your belt. Let’s explore colourwork a little further though, as the possibilities are quite exciting beyond stripes. This post is exactly what it says on the tin - a 'Taster', as this subject is huge, and it has been a struggle to decide what to cover. Forgive me if I have privileged one topic over another, and I hope there is something for everyone here. So, you can knit straight stripes across your work, but what about wavy stripes? These are called Chevron Stripes, and they are created by combining colourwork with shaping techniques. Shaping is spaced evenly across the row, with a gap of a few sts or more between shaping, and alternating between decreasing and increasing. The position of each decrease or increase is maintained vertically on every other row, and this creates the up and down shape of the stripes. You can change colour whenever you want (as long as its at the beginning of a row), but I would suggest always changing colour on a right side row, because this way, you can carry the yarns up the side of your work for when they are next in use, and avoid having too many ends to sew in! This is a fun technique to experiment with. Chevron stripes can be knitted in st st or garter stitch or a combination. Carry yarn up the side in the same way as shown for st st stripes. How about knitting with more than one colour in one row? Knitting with a contrasting colour across a whole row is relatively easy. However, knitting with more than one colour in one row will need a little more explanation. The simplest way to do this, is to use what is called the ‘slip stitch technique’. It gives the appearance of two colours in one row, without any of the effort! Only one colour is actually employed in any one row, but more than one colour appears in the fabric. The stitch worked in the previous row in a different colour is carried vertically by slipping it rather than working it. 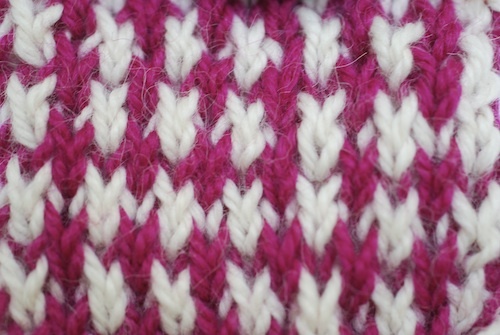 There are many different stitch patterns that can be created using this technique by varying the number of stitches slipped or knitted, and by varying the wrong side row pattern too. Here is a very simple pattern you might like to try. When it says ‘sl pwide’ the pattern means ‘slip the stitch purlwise’ which you do by just inserting your right hand needle into the st as IF you were going to purl it, but then move it onto your right hand needle without purling it. Row 1 (RS): *K1 in A, sl pwise; rep from * to last st, k1 in A. Row 2: P in Yarn A. Row 3: *sl pwise, k1 in Yarn B; rep from * to end. Ok, I am just putting of the inevitable - introducing you to the concept of stranded knitting. Stranded knitting is a generic term which is applied to various different styles of colour knitting, all of which use the same basic technique for getting colours from one position to another in the same row. The technique involves carrying the yarn across the work horizontally. So, let’s assume you are knitting in stocking stitch on a right side row (knit). Imagine the pattern calls for you to knit one stitch in Yarn A, followed by 3 sts in Yarn B. Knit the st in Yarn A, then pick up and use Yarn B for the next 3 sts. So what next? How do you get Yarn A to the next st, to repeat the pattern? Drop Yarn B and pick up Yarn A, passing it behind the 3 sts knitted in Yarn B on the wrong side of fabric, making sure that the yarn is at the same tension as the 3 knitted sts. So, whatever width is taken up by the 3 sts, sitting in a well behaved position on your needle, neither touching nor desperately trying to get away from each other - that needs to be the same width as the amount of yarn that is carried across. Does that sound over complicated? Well, its not meant to me. Please don’t get your tape measure out - just relax! Many designers, like Ann, primarily use circular needles, and all their colourwork is knitted in the round, which has significant advantatages when knitting with different colours. However, if you don’t fancy circular knitting or would like to have a go at stranded knitting but don’t feel confident to do circular knitting at the same time, then stranded knitting is perfectly possible on straight needles, particularly if you choose a pattern that doesn’t have too many colours and doesn’t have more than two colours on any one row. I confess to being a die-hard straight needle knitter, and I knit moreorless everything on straight needles. All my patterns which call for a bit of stranded knitting are knitted on straight needles. If you are going to try stranded knitting, apply a bit of technique to your stranding. Your main colour is your Dominant Yarn, and you would be best advised to carry this across the work at a lower level than the other colour. If you are working with three colours (more unusual in one row), then there will be three levels. Carrying the yarn across at the same level is will give your layer of strands an even appearance and moreover, you will not get your different strands of yarn tangled up and twisted as you work. Fair Isle Knitting: Originating from the Island of Fair Isle off the West Coast of Scotland. Scandinavian Knitting: I couldn't find much on this, but here is a link to some lovely designs in Scandinavian style. Icelandic Knitting: I was looking for some information about Icelandic Knitting and got distracted by this fantasy of a Knitting Tour of Iceland! When a pattern calls for blocks of colour worked over more than 4-5 sts, stranded knitting is not an appropriate technique. Instead, different sections of colour need to be worked from separate balls of yarn, often wound onto bobbins for ease. The yarns are twisted together at the point of colour change, to stop holes appearing and keep the evenness of the fabric on the right side. Intarisa techniques are used to create motifs and collage, or even for patchwork effects. These might be all over patterns, or they might be a single motif on a plain stocking stitch background. 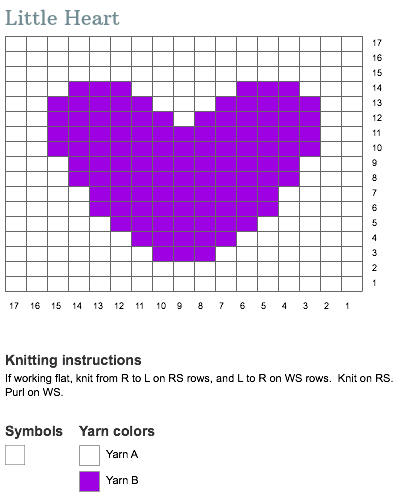 Intarsia knitting is always worked from a chart, such as the one below. You might like to try knitting this with some of your left over yarn from Knit Camp. Knitting with two colours per row is far easier than knitting with three or more colours. This doesn’t mean your project has to be restricted to two colours, as other colours can be used in other rows, and the interest created this way. A good design will be well written with the user in mind. Scan through the pattern before buying to see if you are going to have to use more than two colours in any one row. Choose a wool yarn wherever possible, as wool fibres tend to cling together, minimising any holes or evenness in your tension. Join the yarn in loosely, by just starting to knit with the new colour (leaving a 5cm end to sew in later), without tying a knot. Knots should never be tied in knitting, even when sewing up. They have a habit of popping through from the wrong side to the right side, and as well as being unsightly, they create extra bulk and unevenness in your fabric. If working with small amounts of lots of different colours, it can be helpful to measure out a length of yarn from your ball, wind it round a bobbin and work from this instead of the ball. The bobbin is lighter than the ball, and easier to manoeuvre. If you are really keen, and are a continental knitter, you can also get a knitting thimble or Strickfingerhut, which is a guide for holding yarn on your left finger. Knitters who have adopted the English style of knitting, will probably find that they will ‘throw’ the yarn, using their RH, dropping the yarn not used as they pick up the new colour. Alternatively, they may find a method of holding both colours between their RH fingers. Continental knitters, will hold both colours between their left hand fingers. Knitters who are accomplished in both techniques, may find that they can hold one colour in one hand and one in the other. Experiment to find what works for you, as there is no ‘right’ way. Let's Knit have lots of free patterns using various different techniques for using colour. Search on ravelry for patterns. Type in 'colourwork' for starters, then you can refine your search to the items you want to look for. The UK Hand Knitting Association is a great resource for free patterns, as well as being packd with information for knitters about workshops, tutorials, events and more. Its well worth familiarising yourself with this site and adding to your favourites.